The SmartWORKS IPX is an essential component of your call recording solution that provides packet filtering and media forwarding for IP-PBXs. 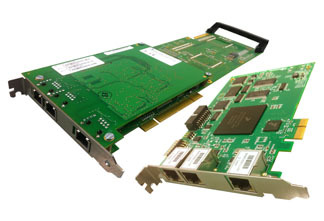 It has one on-board connection for forwarding up to 960 RTP streams and two on-board connections for monitoring the IP traffic at the wire speed. When combined with the HPXMedia, the IPX provides complete event triggering, call state reporting and media processing for many of the industry leading IP-PBXs. The same hardware supports multiple protocols including Skinny and Avaya and is designed to accommodate future protocols such as SIP and H.323 with just a software upgrade. The same hardware supports SIP, H.323 and Skinny (SCCP) etc. and is designed to accommodate future protocols with just a software upgrade. Applications can start and stop recording based on AudioCodes call control or take advantage of PBX/protocol specific messages. connected passively anywhere within the IP-PBX configuration. Up to 480 media sessions per board can be monitored at a time. The IPX software includes a Session Manager for tracking media sessions on the IP network. Each media session is treated as a unique call with a unique Session ID. Your application can easily manage media forwarding with the Session IDs provided by the IPX. Automatically locates all VoIP endpoints on the network and assigns each a unique Station ID. call is already ended and report the ““EVT_MEDIA_SESSION_STOPPED” to user application. This feature can avoid the recording problem due to lost packets. Confirm with our sales person for more details on the exact model number and phone set type supported.